Fishers from Pallamallawa and long time supporters of Bingara’s Easterfish competition who, until this year, have manned the weigh in station at Copeton Dam during the Easter weekend, enjoyed their freedom to fish in the first Easterfish Catch and Release competition. 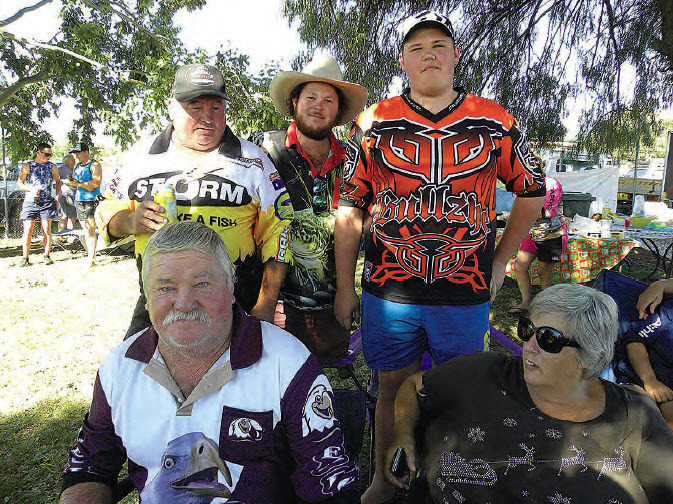 Pally fishers, Merv Ford, Jeremy McNamara, Luke Hobday and in front, Greg Macey, with support crew await the presentations at the Bingara Hatchery on Sunday. The changed format was deemed a success by the Easterfish Committee, with an increase in entries from 117 last year to over 185 this year. According to Anglers Club President, Stuart Lanagan, anglers came “from all over the place”. Stuart said it was a lot simpler to put the fish on a special “brag mat”, which is turned up at one end. The mat is placed on the ground, with the fish’s head against the end, and, a little ID card with a number is put on the fish, and the photo of the fish is sent by phone or facebook to the organisers. The only problem that arises is the notoriously mobile coverage in the Gwydir River and Copeton Dam areas, but the anglers managed to get their photos in. A total of 136 legal length fish were weighed in, plus 20 carp. Most of the competitors remarked that there were many under sized fish caught that were returned without being measured. “I told my fish to stay right there, and grow,” Richie Lyons joked. Richie was part of what turned out to be a Walton family reunion which stretched for about 100 metres along the river. Only three cousins were missing from the reunion which saw 19 children and almost 50 adults gathering by the river. The crew from Pallamallawa brought 19 adults and 12 children, most of whom went home with prizes. Regular competitor, Greg Macey said the fishing was all right. “It could have been a bit better, we had to work for the fish,” he said. Proceeds from this, $100, will be donated to Ronald McDonald House in Newcastle. Anglers President, Stuart Lanagan, said the competition was made possible by the generosity of several sponsors, including the Gwydir Shire Council. He also praised the work done by the committee members who have worked hard all weekend to make the competition a success. The success of the first catch and release competition for Easterfish which has been running for many years, and before that, Octoberfish, will ensure a strong competition in the future.